When you think of James bond and Aston Martins, no doubt the iconic and gadget-laden DB5 comes to mind. Truth be told, when Ian Fleming wrote the novel Goldfinger, he drove a DB Mark III, just like today's Nice Price or Crack Pipe contender. But the question is, will this one's price make it easy to bond with? Yesterday's tire-shredding W123 wagon may have been set up to drift, potentially affecting its streetability but that didn't seem to matter to the the majority of you. Its welded diff turned out to be no big diff and the car drifted into a 56% Nice Price win. For $5,000, Get My Drift? When an automaker takes part of their name from a hill climb event, you can bet that their intentions are noble. So it was with Aston Martin, whose name comes from that of its co-founder Lionel Martin (along with Robert Bamford), and the Aston Clinton Hill Climb in Buckinghamshire. The early AMs were rakish sports and racing cars featuring equally evocative names like Ulster, Le Mans and International. However, as is always the case with British cottage industry makes, Aston Martin fell on hard times, and following WWII was on the ropes. Fortunately a savior was found. David Brown Limited bought Aston Martin around the same time taking ownership of another foundering British marque, Lagonda. This era, beginning from 1947 through the early seventies produced - albeit in tiny numbers - the iconic Aston Martin machinery that the company's present day products attempt to emulate. One of those was the DB Mark III, DB for David Brown and III for Three, which was the final iteration of the DB2 model run. This 1958 coupe is one of only 459 saloons built in total over the course of the model's 1957-59 run. It's based on what would become the last of the Claude Hill chassis designs which features coil springs at each corner, and a trailing arm front and live rear suspension. Girling 12" disc brakes - introduced on the MKIII - sit behind the front sixty-spokers, while Alfin drums backup the rears. The engine is a DBA, the 166-bhp 2,922-cc DOHC straight six originally developed by none other than W.O. Bentley for Lagonda. Here it sports a traditional pair of big-throat Skinners Union carbs -which are claimed rebuilt - and looks complete if not exactly show worthy. That's a theme by the way that will continue with the rest of the car. Behind the engine is a David Brown four-speed manual, and according to the build sheet included in the ad that sadly does not seem to be itself backed up by the optional and desirable Laycock-de Normanville overdrive. What this car does have is the steering wheel on the right, reportedly originally having been purchased by an American businessman while in Blighty. That'd be something to get used to but does elevate the car's inherent tweedy Britishness. Another thing that might take some getting used to are the leather bucket seats which, while in apparently decent shape, have taken on the hue and texture of an octogenarian's sahara-like tongue. Unless you're a peanut-passing monkey, that's not exactly an image you'd want while driving your classic grand tourer. The outside is similarly age-worn and is missing its grille, but is thankfully less evocative of being licked to death by zombies. The Tickford (yet another British orphan David Brown brought into the fold) body remains stuningly attractive, not even detracted by the use of off-the-shelf Hillman Hunter tail lights. It's all aluminum so rust isn't an issue up top, and neither does it seem to be down below the equator where you might expect there to be some evidence of nature attempting to take its course. The seller claims the car to have originally been sprayed in Cardinal Grey, and that - or primer - is showing through the dull coat of BRG it now carries. With fewer than 47,000 miles on its lovely Smiths clock, this Aston could be fodder for a Robert Frost poem due to the divergent paths it could take. Its seemingly tight all-original condition is perfect for keeping as-is and potentially racking up trophies in Concours' Preservation class, or as a basis for a full-on restro, returning this tourer to its original grand shape. That latter choice will take cash on top of the basic cost of entry, and that might just weigh into your consideration of this car's requirement of that not insubstantial $135,000 Buy It Now button click to purchase. What do you say, is this survivor worth surviving that big a payout? 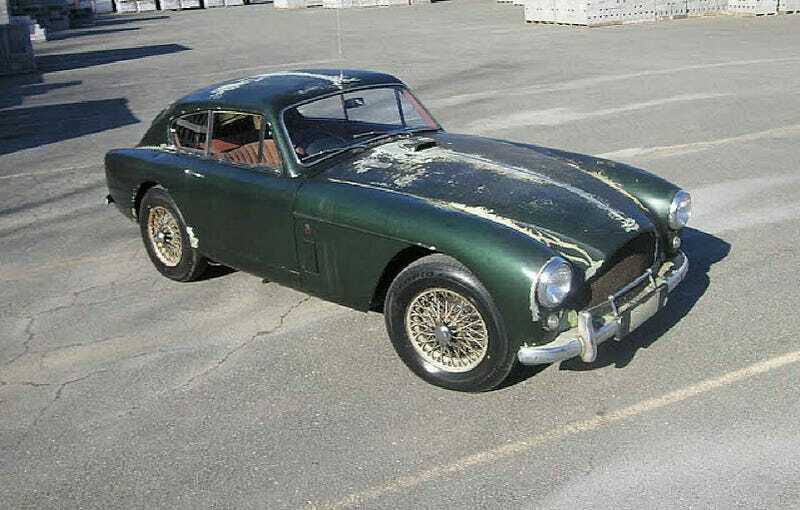 Or, does that price make this Aston not your favorite Martin?